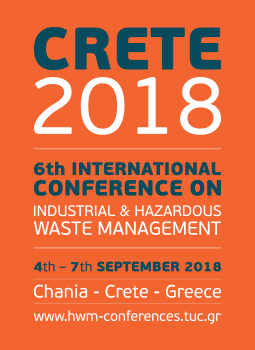 The 6th International Conference on Industrial and Hazardous Waste Management is going to be held from September 4th to September 7th, 2018, on the beautiful island of Crete, Greece. CRETE 2018 will be a special event, as it marks the 10th anniversary of this unique IWWG conference series, which is traditionally organized by the Technical University of Crete, the University of Padua and the Hamburg University of Technology. Several amendments and new approaches have already been planned and even more are still under consideration. Tsinghua University of Beijing is joining in as a co-organizer, broadening CRETE 2018 boarders to the East. An updated and extended spectrum of Conference topics has been formed, in order to allow a holistic approach of industrial and hazardous waste management and create an even more appealing, interesting and riveting Conference program. CRETE 2018 Organizing Team is working on new ideas and events, in order to make the upcoming Conference even more successful, always counting on your high quality contributions and presentations. We are looking forward to co-operate with you all and welcome you once again to Chania! Upon request, the deadline for paper submission has been exended until 15th June, 2018.